Our keynote speakers are presented on this page. Go to to the program page and download the final program. 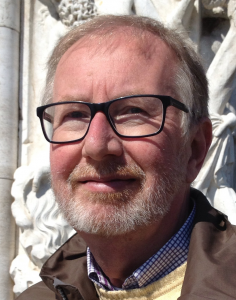 Per Gustafsson has worked in child psychiatry in Östergötland, Sweden most of his professional career. He received his PhD with a thesis on family therapy as an adjunct to traditional treatment for severe asthma in children. His research interest is the intersection between body and mind: how psychological factors affect physical health, and how does it affect the biology of mental well-being? Since the most important environment during childhood is the child’s own family, interest in the child’s interaction with his/her parents and siblings, i.e. family interaction, has been at the center of interest. Likewise, how family therapy can be a way to influence children’s mental and physical symptoms. In 2017 Per became professor emeritus in child and adolescent psychiatry and he continues to be active as a researcher at Linköping University. An adolescent child in transition? In the Harry Potter series, Remus Lupin changed to his werewolf form when the moon was full. However, he didn’t go from human to werewolf just by snapping his fingers: the fangs and hair had to grow, the spine to become curled, the hands to become more pawlike and the fingernails lengthened into claws. If you saw the movies, the business of transforming from human to werewolf didn’t look like a whole lot of fun! The point of maximum discomfort – where Lupin is half-man, half-werewolf – is a state of transition between two forms. All adolescents go through the transition from being a child to becoming an adult. If you have a chronic medical condition you also have the additional quest to take over the management of that condition together with the management of your life. ADHD could serve as a “model condition” for this, and also represents a challenge for caregivers to facilitate the bridging from paediatric to adult care. 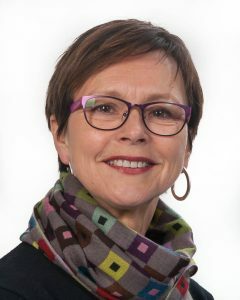 Hanna has been an adjunct to Umeå University from 2000 and in January 2016 she was appointed associate professor at the department of language Studies at Umeå University. She completed her PhD in 2015. 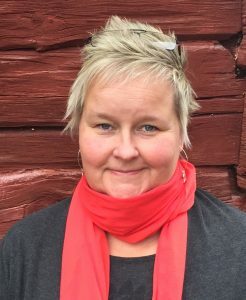 Her main research focus lies on Sámi languages. Her special research interests are writing processes, the multilingual minority classroom, and teaching and teacher training in national minority languages. 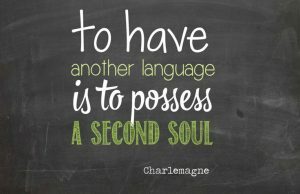 It is often said that a bilingual person does not exist in one language or another, but somewhere in between. It is the knowledge of many languages and the belonging to several cultures simultaneously that makes it possible for the speaker, or the writer, to manifest different individual and collective identities and perspectives as they choose according to the situation and the need. Yet it is often that the schools and the communities do not see multilingualism as an important asset in the world, but instead, languages are often compartmentalized and the compiled language knowledge is discredited. This presentation offers some reflections on the voices of young Sámi who live in Sápmi, the land of the Indigenous Sámi people, and who grow up to become bilingual and multilingual local and global citizens. The situation in Sápmi, as well as in many other Indigenous contexts, is especially interesting since all Sámi children and adolescents study at least two languages at school, the majority language and English. Many young Sámi also study their heritage language, and some are fortunate to have it as their main language of instruction. At the same time, these young Sámi are more or less voluntarily involved in minority politics, environmental debates, and community internal discussions on what is to be considered Sámi and what comes from outside. The Sámi young are also part of the global popular culture which is often presented to them in other languages than in their own heritage language. In this complex situation, the compartmentalizing ideologies are as much of a threat to the survival of the Indigenous heritage language as is the lack of real and virtual heritage language arenas. Diehtosiida, a Sami knowledge centre in Norway home to Sámi Allaskuvla (Sámi University College), the Sami Archives, Gáldu (Resource Centre for the Rights of Indigenous Peoples) and the International Centre for Reindeer Husbandry. Indigenous Sami adolescents are in general at good mental health and well-being. In previous studies the disadvantaged position and life events that several indigenous youngsters worldwide experience compared to non-indigenous peers, have previously not been found among Norwegian Sami counterparts. However, within group differences occurred in mental health due to cultural determinants such as the ethnic context young people grew up in, their preferred ethnic identity and their cultural practice and mother tongue. Since the first studies on the influence of cultural determinants on Sami adolescents´ health were conducted in the 90´ties, a growing and strong indigenous cultural revitalization process with greater acceptance, stronger political rights, better living conditions and higher education rates has influenced the Sami communities. To which degree such cultural determinants experienced in adolescence influence health and well-being, educational pathway and perceived stress in young adults of today, will be discussed in this presentation. The findings will give us a glimpse of the transitional pathway from adolescence to young adulthood that young Sami experience in different contemporary ethnic contexts. Sofie has a Masters degree in archaeology and is currently a PhD student at the Department of Language Studies, Umeå University, Sweden. The title of her PhD project is “Reindeer and Pink Flamingoes, identity maintenance among Sami immigrants in North America”. Her main interests are Sámi culture and history. 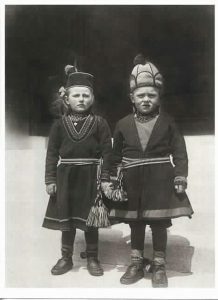 Sami children arriving at Ellis Island New York. This photo is taken by Augustus Sherman sometime between 1892-1907. Clothes are consistent with the style of dress of the Sámi people in south Sápmi, probably in Sweden. From the middle of the 1800’s to the 1930’s a lot of Sámi emigrated from Sápmi (the Sámi settlement area in Scandinavia and the Kola peninsula) to Canada and USA. Some left their heritage behind and wanted to start a new life. There are several reasons why they made a choice to leave their ethnicity behind, to “stop being Sámi”. Many where stigmatized by their governments, others had more private reasons, like love or religion. Others left the reindeer herding, the very core of their lives, and without that, there were no use “to be Sámi” anymore. Many just had a very hard life and struggled to survive like many of the Scandinavians that emigrated at the same time. During my fieldwork in Canada and USA I heard some amazing life stories. Many were about how the children and grandchildren of the original immigrants had no clue about their Sámi heritage, and how they found out in the strangest ways. Some could for example be bullied in school for being “dirty Lapps” by their Scandinavian neighbors, and in present time also as “bloody Indians” by their classmates. Others found out on their parents deathbeds, and some just by the lucky faith of a saved letter that was supposed to be burnt. What was their reaction and how did they learn more? How did this affect them growing up, becoming teenagers and adults? How could they reclaim a Sámi identity and ethnicity that was lost to them? 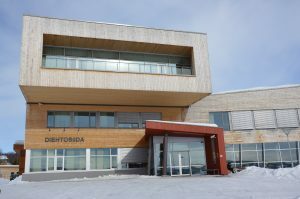 How have they been received in Sápmi? Let me tell you some of their stories. Ronny took his medical degree (MD) in Sweden 1980 and became a certified General Practitioner in Sweden in June 1991. Ronny worked in Sweden as a general practitioner for 20 years. During these years he engaged in research with topics usually found within primary health care. The first area of interest was upper respiratory tract infections with focus on the sore throat and he took a PhD in this topic in 2001. A consequence was further research about the clinical value of diagnostic tests. Example of other areas of research interest is the transition from childhood to adulthood, whiplash-associated disorders (WAD), doctor’s behavior, assessment of the consultation, low back pain and supervision of PhD students. Ronny has been linked with the department of public health and community medicine at Gothenburg University, Sweden where he became Associate Professor in 2007 and Adjunct Professor (≈Collegiate Professor) in 2011. 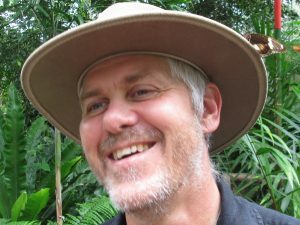 Ronny is also an associate professor in general practice at James Cook University, Australia since 2012. 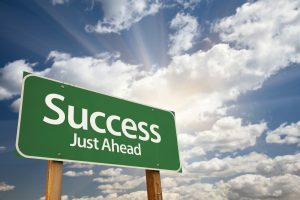 What constitutes success in the transition into adulthood? The transition phase between adolescence and adulthood is a time where young people experience many changes. It is a period where the foundation for many adult diseases and disorders, such as substance abuse, anxiety, and depression are laid. There is pressure on children to move forward into adulthood regardless of the path chosen. We perceive the chosen path usually leads to a successful transition into adulthood. What constituents success in the transition into adulthood? A systematic literature review searching 19 publication databases screening 4,641 publications may provide some hints. (This work was done in collaboration with Dr Anna Windress).